Don't Disturb This Groove: Run, Don't Walk, To Your Nearest Dollar Tree! Run, Don't Walk, To Your Nearest Dollar Tree! 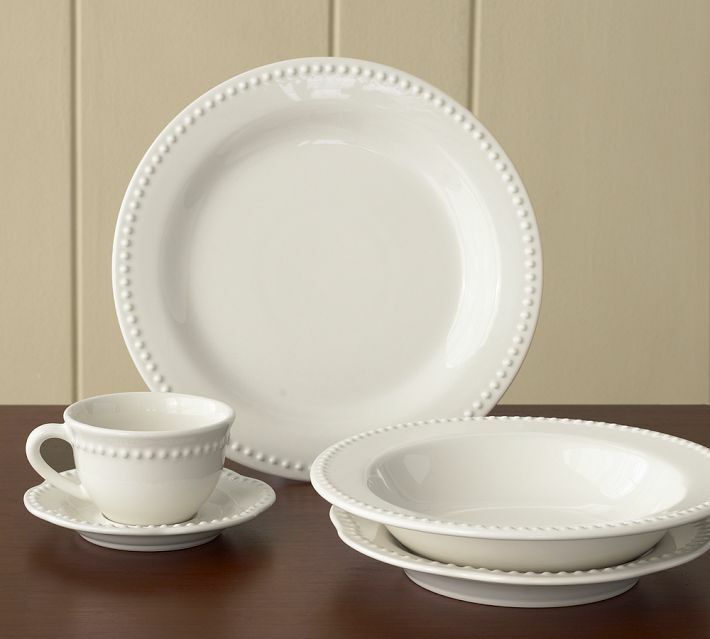 Lately, I've become a little obsessed with Pottery Barn and their Emma Collection dinnerware. The beaded detail makes me really happy! Sadly, their prices do not. For a family of 4, the 20- piece set would have cost around $150, plus shipping. So, imagine my surprise as I browsed around Dollar Tree and spotted these! Woo to the Hoo! I couldn't believe my eyes! I shoved as much as I could into two hands and walked fast to the register. I had to make a second trip to grab the mugs. I planned to purchase 6 to complete the set, but the few that were left were chipped. Hopefully, while I'm out and about this week I can find 4 more. Unless of course, there are more Pottery Barn obsessed, Emma Dinnerware Collection lovin' folks, living in my area! WOAH! What a score! They're beautiful. I might have to stop by at lunch! Wow!! What a great find!! Dollar Tree here I come, again! lol! Ok Brandi, I swear we must meet each other because we think alike. Just last week I brought two plates and two bowls since its just the hubby and I eating off the pretty stuff last week. Dollar Tree, don't sleep on it! That is a great find! Score! Congrats on that. This was a deal and then some!!! What a deal! I may have to run to my local Dollar Tree today! Oh Brandi that was a score, I would love to buy some too. I'll have to sneak them in the house though. Every time I buy new stemware, plates or anything related to dining my family launches a huge protest. What do the know? just because we're running out of space...what? when did that ever stop anyone LOL. I'm going to read your guest post, cant wait to see your new kitchen. Great find Brandi! I have a luncheon to go to, but will be heading to my Dollar Tree as soon as it's over! Thanks! Unbelievable find!! Once my little guy wakes up, we're heading to Dollar Tree too!! Thanks for sharing!! Woo to the Hoo! Now that's funny :) Great find and buy enjoy!! What an awesome deal!!! I love white dinnerware its the only 'color' we buy! I'm stopping Dollar Tree today for ornament hooks and we check out the dinnerware at my store! PS - I have the same Dwell napkins, my BBF bought me a set on clearance! :) Her Target had them on clearance and mine didn't odd huh! I was hanging out at the Dollar Tree for a few minutes on Tuesday. I saw a lot of people in the plate aisle, but didn't even notice what they were buying. Bet they had read your blog? Yay for dollar tree! Thanks! Great find Brandi! I need to stop by the Dollar Tree on the way home. I bought these too! I ADORE them! They will look so pretty with so many different tablescapes! Those are gorgeous!! I'll have to check and see if mine still has them! You go girl!!! I told my hubs I wanted the Walmart ones. I might just settle for Dollar Tree! going to check my dollar store tommorrow, are they microwave safe? Yep, we have some still left (I work PT at the DT) they had them right in front but not for long they must have sold alot because what is left is back in the dish asile. I think they look like they came from Macy's or any high end store! Glad you are so happy with them! Your new white dinner ware is beautiful! We just got a Dollar Tree and I think I saw those in there. I was going to wait until IKEA came to town to purchase white dinner ware, now I'm not so sure! Are you for real, right now?! Brandi, you scored big time!! I haven't been in Dollar Tree recently...but, I think I may have to RUN in today!! Thanks for sharing! That's a great find! Love the set. Great deal! I was in the Dollar Tree this morning. When you see something you definitely have to RUN not walk. Ha! Brandi, you have got to be kidding me! I am out the door as I type, haha!....Wow, that is a great buy! I seriously need to head over there....I wanted some white mugs for the Holidays, thanks for the tip! O,K, Brandi....I was wondering why I was not getting your posts, then I looked and I was not following you...I THOUGHT I was, silly me! Now I am! That needed to be fixed real fast...I need my daily "groove" fix, if you know what I mean! HAHA! Ha -- I just found the same ones and LOVE them! My store was almost sold (boo! ), but I did score 4 plates. So glad you found a set. How nice! Can they go in the Dishwasher?? Oh how fabulous!!! Those are so classy and cute too. Thank goodness you didn't buy the Pottery Barn dishes. oh girl ~ it's on!!!! I am heading off to the Dollar tree this morning. I love that pottery barn collection too!!! Thanks for sharing. No way...I'm heading to dollar tree today...been wanting a white china and this is amazing!!! Wow Brandi! What a great find! Seriously! I am at the dollar store like twice a week, but I guess I never really look at the plates. I love these... will have to stop TODAY! I have seen the most amazing dishes at the dollar store too, but this takes the cake! They're gorgeous! I think this is the place to shop for young couples or singles just moving into their first place. It just goes to show you, you don't have to spend like a millionaire to live like one ;) Well spotted! Holy moly....what a fabulous find, Brandi!!!! Those are absolutely beautiful!!!! :) Looks like I've got to start popping in to my DS more often.... lol! Oh my gosh what a find! I'm going to my Dollar Tree tomorrow. Thanks for sharing! Those are beautiful! Gotta get some! You've given me an last-minute idea for a Christmas gift. Don't you just love finding something you really want at such a fabulous price? The dishes are great! That is exciting news! Those plates have been on my wish list for quite some time. I hope my Dollar Tree has them. Thanks for sharing! brandi, you scored bigtime! woot woot! What a find, Brandi! I may have to run over to my local Dollar Tree and check it out. Move over Homegoods! You did find a great deal. They are very pretty. I need to go there because I have a weakness for china...Love it, thanks for sharing. I see I'm late to the party, hope there are some left! Thanks, what a deal! I would've never expected to see this at dollar tree! I'm going to see what I can find for a family who lost everything in a fire. This would truly be a blessing. I bet it's too late for me to find some! But I will go see tomorrow! Oh my, I was just in DT today, too!! Too bad I didn't know about the PB look-alikes then. Thanks for sharing!! I can't imagine ever paying that much for dishes...especially when the set you got is just as lovely! ARe you kidding me??? I'm so there. Thanks for the scoop dear and have a very Merry Christmas! Sweet deal Brandi..they sure look just at nice as PB! I'm tellin' ya, girlfriend...these are EVERY bit as great as PB's. What to do when you run out of wrapping paper?